Simple Spiced Apple Bread — Copina Co.
It’s officially Fall! Is there any better season for cozying up in a blanket and waiting for something delicious to come out of the oven? On the blog today is this dreamy Spiced Apple Bread. It’s your new best friend - totally simple to put together and basically Fall in food form! 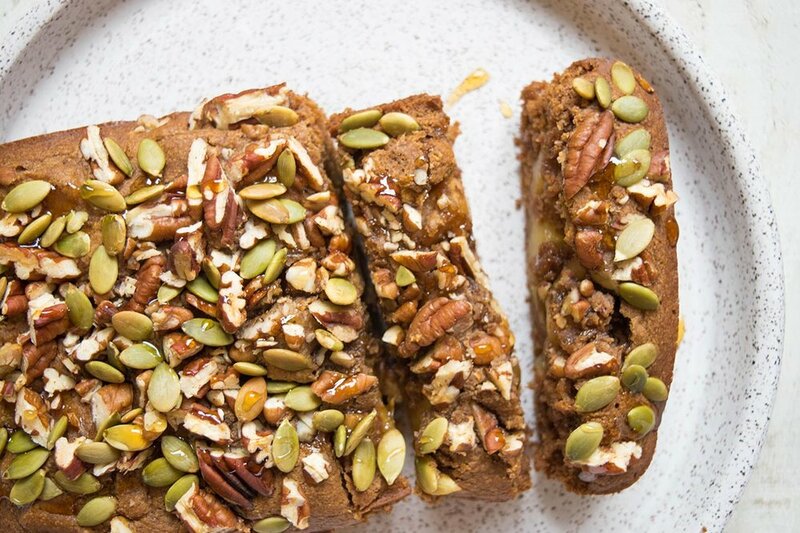 Try this with your favorite tea or elixir as you head out the door in the morning or enjoy as a nighttime dessert as you watch the Fall leaves change.My childhood best friend’s mom used to always make apple bread for us when I was a kid and with the sweet tooth I had, it rarely lasted more than a few minutes out of the oven! This was the favorite dish for Gilmore Girl and sleepover parties for years. I’ve switched to eating a plant-based diet and avoid gluten and sugar, but that doesn’t mean I don’t crave my favorite childhood foods! ;) I’m really excited to share this amazing healthy version of my friend’s recipe with you all. There is nothing more perfect for a late September weekend and I know you’ll love it as much as I do. Start making this bread by adding the dry ingredients in a large bowl. Stir well and set aside. Take a separate bowl and add the wet ingredients from the apple slices to the maple syrup together. Stir well, then fold the dry ingredient mixture into the wet ingredients. Grab a rectangular ceramic or metal bread pan and spread some almond oil along the sides of the pan if it isn’t already non-stick. Add the dough, spreading evenly though the pan, then sprinkle chopped pecans and pumpkin seeds on top. Bake in for 25-30 minutes, or until you can cleanly poke a form through the bread. Top with extra cinnamon and honey if you’d like some extra flavor and enjoy!